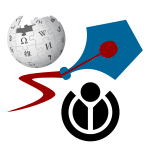 Original logo in the public domain, Wikipedia/Wikimedia logos copyright by Wikimedia. 20. feb. 2011 kl. 05:41 135 × 135 (4 KB) Stwalkerster Reverted to version as of 21:55, 16 February 2011 - this is BREAKING the contact pages on a lot of wikis - why was this reverted to the broken (too big) version?